What do you say when your 5 year-old hands you a headless rabbit? Yeah, I was tongue-tied too. We were out working in the yard when I pointed out to Prairie Girl that her barn cat was carrying a freshly-caught bunny in its mouth. A split-second later, I heard “Here, Mommy” and turned around to see her holding a decapitated rabbit by it’s hind legs. I stuttered for a minute before quickly explaining the rabbit was beyond the point of saving. Prairie Girl begrudgingly returned the bunny to the annoyed cat, and I couldn’t help but smile at the thought of my blonde-headed little girl wrestling a headless rabbit from the mouth of a hungry kitty. She seems to have inherited her mama’s strong stomach. But that brings us to the topic of rabbits. It wasn’t so bad when we had our two athletic dogs, but ever since they passed away, the bunny population has sky-rocketed. Our remaining dogs (an old, fat one, and a big, slow one) just aren’t cutting it, and although the barn cats will grab one here and there, they still aren’t making a dent. Truthfully, the rabbits wouldn’t bother me much if they would just stay away from my vegetables. We have a fence around the garden (hog panels plus chicken wire at the bottom), but I think they are still squeezing in somewhere. And they have done a very thorough job of eating every.single.one of my cucumber plants down to the nubs. I’ve been doing a lot of research lately on rabbit repelling sprays, and versions of this liquid fence recipe get rave reviews. The key is to make it stinky… Very, very stinky. So I mixed up a BIG batch of this homemade liquid fence recipe and have been spraying it religiously. Some folks say it works for deer too, but since we don’t have deer problems in our garden, I can’t vouch for that. Crack the eggs and combine them with the garlic and water in a bucket (use an old bucket you don’t mind getting icky). Cover the mixture, and set it outside in the sun for 24-48 hours. Yup, that’s right. We want it to ferment and fester and get really, er… strong. After it’s had time to get nice and smelly, strain out the garlic chunks, then mix in the soap and clove essential oil. Place the liquid fence mixture in a sprayer and spray generously around any area of your garden or yard that is being overtaken by rabbits. I spray mine around the perimeter of my garden, in between the rows that are having the most problems (cucumbers! ), and even on some of the plants. Reapply after heavy rains or watering. WEAR GLOVES with you apply this stuff! This liquid fence recipe stinks like crazy and the garlic makes it hard to wash off your skin completely. It doesn’t burn or anything. It just stinks. 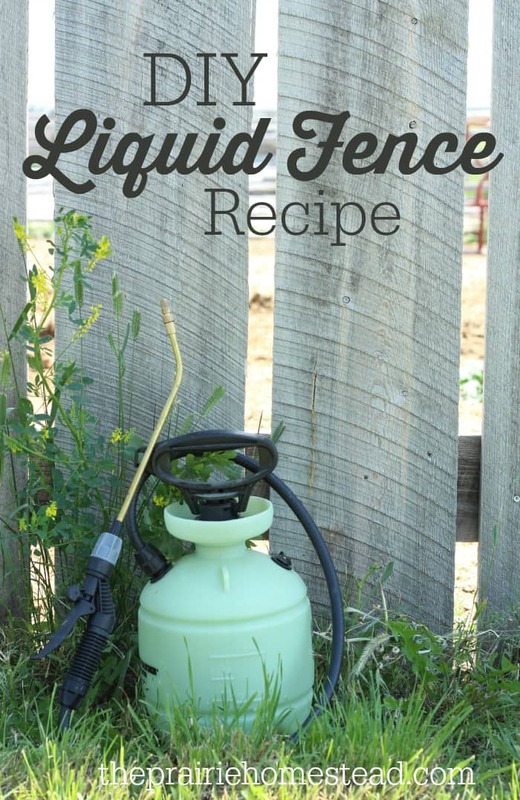 I use a garden sprayer for my liquid fence recipe. It makes the application process much easier, as compared to using a small spray bottle. Although, if a small sprayer is all you have, it’ll still work, your hand just might get tired. As with any spray I might be using on my plants, I try to apply this in the evenings and avoid the heat of the day. Sometimes a spray, combined with the sun’s rays, can “burn” a plant’s leaves a bit. I haven’t had any problems thus far, but just FYI. 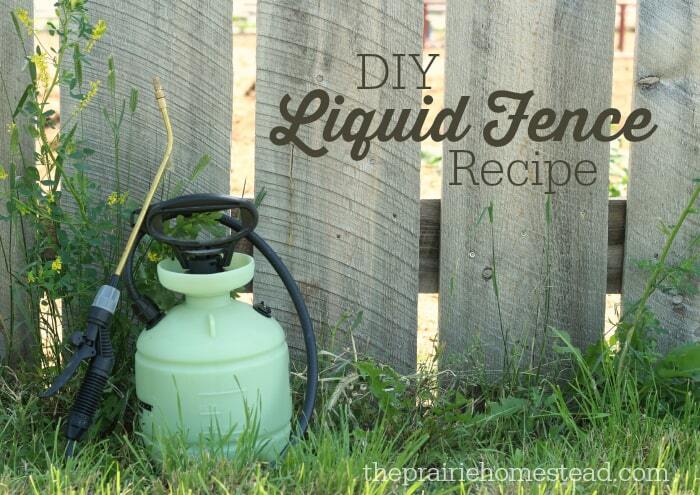 You can totally cut this liquid fence recipe in half if you want to make a smaller amount. I let my sprayer sit a few days before cleaning it, and the egg residue clogged it up a bit. It’s best to use a full batch and then clean everything out between uses, if possible. If you don’t have clove essential oil, you can add 10-15 whole cloves to your liquid fence recipe and allow it to steep with the garlic before straining. Or, just omit the cloves altogether. I live trap rabbits out of my garden using apples and peanut butter as bait. Only thing to keep groundhogs away is a good dog..those critters are bulletproof I swear. Hi! I have people asking me if this is a research based, proven remedy for stopping rabbits or other rodents, etc., from invading their gardens. Of possible, can you share with me the origins of this spray, how it was developed and successes? Thanks in advance! Appreciate it!! It’s an old remedy that’s been floating around for a while. I just edited it to create my own version. There is no official scientific research on it, just old-time common sense. Deer fence. Will need surveyors tape for 3 times around your garden. I use red color. Not sure deer see color. On corner post , wrap at half way up post. This may be 2ft in height or whatever is your height of post. Will need to wrap tape around other posts in your fence line. Leave opening for a gate. Put posts 2ft out from first dense line. Put tape on 1 ft height and 3ft height. You will need other posts in your fence line. Leave opening for gate. I’m not certain a real rope works. the tape can stretch in the wind over time. I still had to have fence wire at bottom for pesky rabbits. I can vouch for it working for deer. I have a hosta garden IN the woods and the deer leave it completely alone. Once I discovered a recipe such as this the deer left everything alone (including our fruit trees). And because there is dish detergent in it… ahids and other such pets leave things alone too (at least they did our fruit trees). Instead of mashing the garlic cloves and letting it sit – I just use 2 tsp of garlic oil. Just my pocket change. Just what I was going to ask. We have several fruit trees at a property we only get out to twice a month. The rabbits don’t bother my garden for some reason but I have lost two trees due to (I think) the deer chomping down on them in the spring. Thanks. I don’t personally have deer problems, but I have heard of other folks using similar recipes for deer. Sure worth a try! From what I have observed and understand to be true… this recipe needs to be reapplied [at least] once every month. I apply it on the 1st of each month – especially when those tender green sprouts come up for the first time in the spring!!! I wouldn’t allow your fruit trees to be unsprayed for more than one month. VERY good to know Lori– thanks for sharing your experience! If you should happen to get garlic on your hands or skin anywhere get an old wooden spoon, lather the area up really well, then “scrub” the wooden spoon over the area affected. If it’s your hands just cup the bowl of the spoon in your hands and wash them around it. Voila! Nor more garlic smell on your skin. Fantastic tip Gayle– thank you! You can also rub your hands on the kitchen faucet or anything stainless steel. This works great for fish smells also! I don’t have gopher/mole problems, so I can’t say for sure. Worth a try, though! Sounds like a great solution! Those bunnies and chickens are determined, huh? Hi! 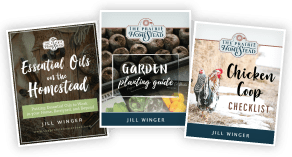 We recently started our journey towards homesteading and your website has been an amazing help! Deer are compromising all my hard work, so I’m happy to have come across this. Thanks! My daughter has a feral cat problem… they mate and have babies under her house. Even though she has had the area “sealed” they still manage to get under there and do their business. I can’t imagine her using this method around the perimeter of her home, but do you have any suggestions for nudging them to move elsewhere? Please don’t tell me to have her trap them or adopt them. She already has plenty of critters and traps make her cry. Even humane traps? Because my suggestion would be spay and release. If you just get rid of them, more will probably come, but if you spay and neuter them and put them back they will still keep it as their territory, but won’t keep breeding. Not sure about where you are, but around here there a number of non-profit spay and release programs that would cover the costs. Thank you for your response. Apartment complexes here can get help from the Humane Society, but individuals have to pay about $50 dollars apiece for the HSO to come and get the trapped cats, operate on them and the return them to the home. My daughter doesn’t make that kind of money. She more or less inherited them when she rented the house. She’s so afraid they will die under there and she’s already found one dead kitten outside one of her windows. Moth balls repel lots of critters- worth trying for feral cats. I opened the outside door and then slipped a bug bomb out into an enclosed porch to chase out a skunk that came in the cat door (for tame cats) and didn’t seem inclined to leave. No longer use cat door. These solutions sound rather harsh, but I wouldn’t be nice if feral cats were pooping under my house. A flea infestation is a possibility come summer. You might mention PetSmart Charities gives grants to shelters to do TNR programs. They also make grants to cities. So maybe you could make it happen for your community by talking to town hall and your shelter. Our town humane society doesn’t charge anything for TNR. Cause these cats do wind up in shelters or are euthanisized by county animal control that costs a lot more. I’ve noticed a significant decrease in feral kitties. 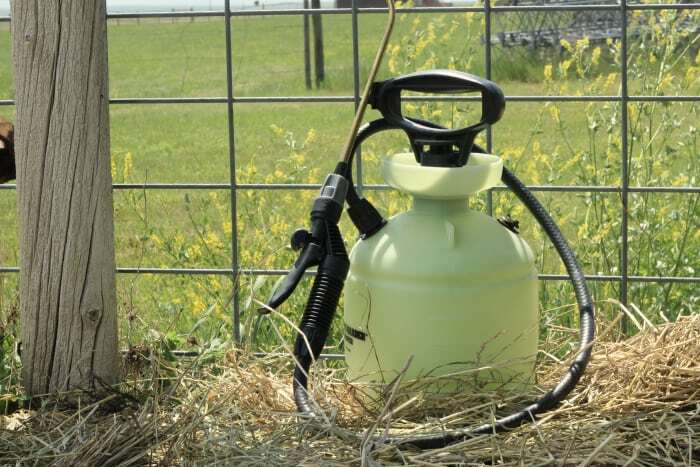 For protecting the fruit trees with this, were would you spray it? This is for deers… Thanks for the recipe! 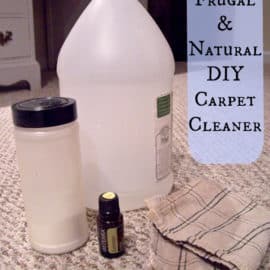 This sounds like another great remedy to critters in the garden, but I wanted to share a solution I’ve been using for years with great success that is perhaps much easier & less work. 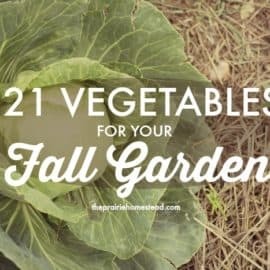 Rabbits, deer, raccoon, opossum, squirrels, & even many bugs hate the pungently strong & bitter smell of marigolds, so I plant a border of them around my garden vegetables every year & have yet to ever have a problem of anything eating my veggies (except for those darned green Japanese beetles on my berry bushes, which I have a pretty good natural solution for that too if anyone is interested in hearing it). Now mind you, I live deep in the woods where critters are so prevalent I can look out my door of the morning to see turkey, deer, opossum, & even fox lounging in my yard or snacking on the acorns & wild persimmons that fall in abundance at my abode. Granted I also have 3 cats around to chase after only the smallest of the assailants, but I’ve also witnessed those same cats pass leisurely by a fat opossum attempting to get into my trash on one occasion so I don’t put a lot of stock in their garden guarding abilities. Lastly, someone mentioned getting rid of the garlic odor on hands; fresh or dried lemon balm leaves rubbed between your hands are amazing for removing any foul odors & replacing it w/the wonderful clean aroma of sweet lemon! So far no problems with rabbits. My pickling cucumbers are going gang busters (sorry to brag, just so excited) but almost all of our tomatoes are dying. And the corn and pole beans are not doing much of anything. Do you have a solution for birds? I think they are eating the seed. I’ve been scratching my head over the birds too. I think they’ve been picking at some of my seedlings as well… I’ll let you know if I think of anything! In Wichita where black birds sit on and smother plants, I stuck the sharp bamboo sticks you cook Kabobs on around and in the plants. So far, so good. But it takes a lot of sticks. I also used plastic forks plastic straws and even old knitting needles. I don’t have a rabbit, however squirrels run crazy in the are I live in. I live on 2 1/2 acres and days it seems like we have so many that they have called a ‘soccer day’ lol. Do you have any suggestions for these little pains in the neck? I don’t have much of a squirrel problem, so don’t have a lot of ideas. This spray *might* work, though! What do you have for mice and rats in the yheard. We have a few fruit trees and the fruit falls to the ground and I think that is what brings them around but what can I do about it. One of our cats we call the great hunter and she gets the rats but they are pretty big. We have tried traps but they aren’t working. Please help. Thanks We live in Washington. Will your recipe work on them too? Haven’t tried it for something like that, but worth a shot! Here in Oregon, if you don’t want bears you pick up the apples. Get one of those long-handled grab bar (Dollar Tree). I leave them in a bushel basket on the curb for the critters…..keeps them out of the yard. I haven’t noticed the rats eating them. Just deer and bear. 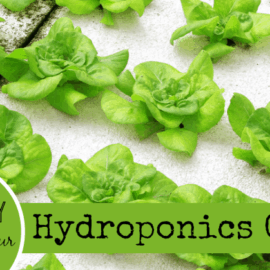 We water our garden every day during the summer if it doesn’t rain. Would we need to apply this everyday for it to work? Might try adding red pepper to the recipe for squirrels. This works great for deer. My formula adds cayanne pepper, so if they taste, it’s even worse. Woody – does your formula call for 2 eggs to 1 gallon of water? 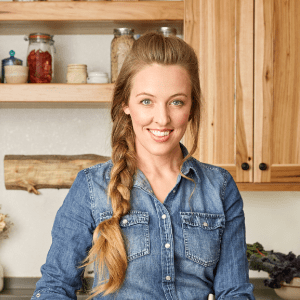 I’ve read other recipes w/ same number of eggs and 2 cups of water? I’m using it for deer. Just wondering. 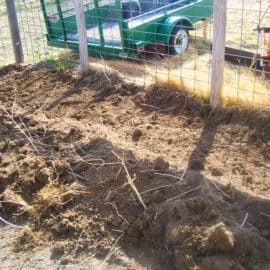 JILL ~ are you still having problems with rabbits with your new raised beds? Also what have you discovered about the straw/hay quandary ??? love the 2017 garden tour…the prairie kids are really shootin’ up … thanks for all the wonderful stuff you post. 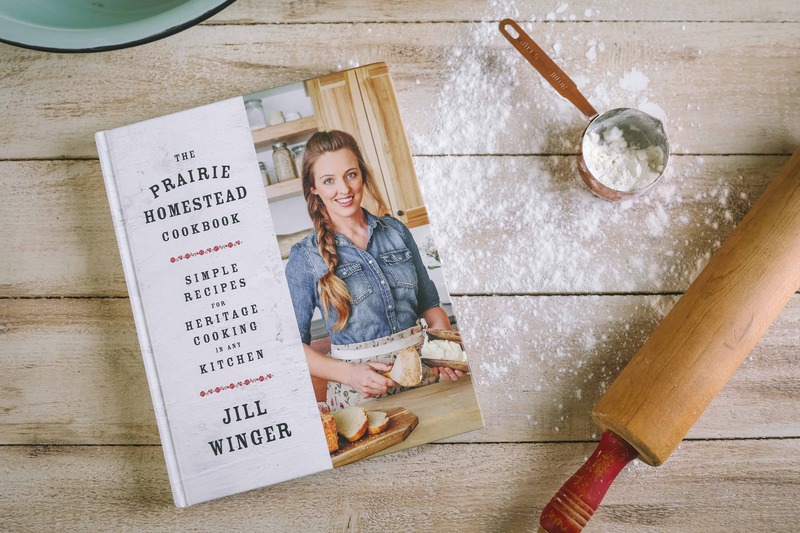 Jill – My 2-gallon sprayer clogs up after a minute of spraying. It works w/ straight water but not this recipe. I used garlic oil instead of crushed cloves so am wondering if you think oil might clog it up. It is a Scotts $18 sprayer. I did not use the dish soap and am wondering if that’s why as I’m not sure of the dish soap’s purpose in your recipe. Dish soap keeps the sprayer from getting clogged and holds any liquid with it in place so the liquid won’t just drip off to nothingness. This is a subject close to my gut! I used citronella essential oil mixed with water (about 20 drops EO to a gal. of water..stronger the better) to stop the ground hog problem I had. I just sprayed around the base of the fence. None this season. Last year I saw about 15. Some were eliminated. None came back this year. the EO spray didn’t help with the rabbits. Mommy bunny had 3 little ones hidden in the tomato patch. The citronella EO helped temporarily with a bat I have in my attic. Now that I’m reminded of it, I’ll spray again. Rain does lighten the scent. Thank you – Thank You – THANK YOU! Perfect timing. We have a rabbit epidemic this year too. They are eating our bean plants. This will be made and sprayed. My deer problem is your rabbit problem. They have killed and damaged more of our fruit trees than I can even count. The seem to devour just about anything, berry patch, garden, orchard, you name it. In Fall our problem is all the bucks rubbing the little trees. I have used a variation of your recipe but I use 10-12 eggs and lots of cayenne pepper. I never thought about the clove oil or leaving it sit for a couple days first. My next batch will definitely have those improvements. It usually works if I get it on before the deer get to stuff, but you do have to reapply every few weeks for it to stay effective. Does this work for wild turkeys? Hi! I made the recipe about it’s been 3 days already mine still not really stinky, I can smell the garlic but the eggs doesn’t smell like it’s rotten what am I doing wrong? You mentioned it had to be really stinky should I let it sit for several more days? When I lived on the farm in West Virginia, we planted Dusty Miller thickly around the boarder of the garden to deter rabbits and other garden menaces. Rabbits can’t stand the stuff. You might try adding a tea made from Dusty Miller leaves in you mixture. Let me know what happens. I was told that amonia sprayed on rags and placed where skunks and raccoons were coming in to my yard under my fence. Imagine my surprise when I saw baby skunks playing with the rags and tossing them in the air for fun . My neighbor says the only method for skunk removal was live traps or 22 caliber bullets.